In a thrilling encounter at the Riverside on Saturday, Blackpool did well to emerge with a point against a strong Middlesbrough side. Boro twice took the lead but goals from Ludovic Sylvestre and Jonjo Shelvey secured an away draw for the Seasiders. Here are my observations on the game. Middlesbrough will have been disappointed not to have taken all three points on Saturday, and a large contributing factor in that was the performance of their strikers, Marvin Emnes and Scott McDonald. Both have had to endure a tricky spell to start their careers on Teesside, but now seem to be through that stage and look a real threat. Emnes was the player that had most ‘Pool fans talking after the game, his ability to hold the ball and his directness causing problems for Ian Evatt and Craig Cathcart, with Alex Baptiste also having a decidedly rocky first half struggling to cope with the Middlesbrough forwards. Emnes did have a tendency to go to ground a little too easily, but it’s easy to see why Boro have had a good start to the season on the back of 10 goals from the Dutchman. For me though, the more impressive of the two was McDonald. Arriving on a hefty-by-Championship-standards pricetag – £3.5m from Celtic – McDonald bagged both goals for the hosts and I was surprised to learn he’d had something of a scoring drought this season up until recently. Despite his relative lack of height, he won more than his fair share of headers, and was perhaps unlucky not to get a hat-trick on the day. After their successful month long spell on loan at Sheffield United, Matt Phillips and Billy Clarke both featured from the bench at the Riverside. Whether they’d both have made the 16 without the late removal of Lomana Lua Lua from the squad – Ian Holloway left him out after the forward missed a team meeting on the day of the game – is unclear, but given how they performed at Bramall Lane it was just reward for the pair. Of the two, it was Matt Phillips who demonstrated a more visible impact once he joined the action midway through the second half. Phillips did not only assist Shelvey’s equaliser, but he was also involved in a few similar chances that may have even won all three points for Blackpool at the death. It’s important for Phillips to have confidence back in running with the ball and crossing into dangerous areas. Saturday was a fine example of how to do that, and if he can replicate that form as the season progresses, there’s no doubt he can play a big role for ‘Pool this campaign. Clarke had fewer minutes on the pitch to impress, but still showed signs that his spell on loan has been productive. Clarke won praise during his loan spell for the creative side of his game playing just off the main striker – the lack of goals more than made up for by the amount of goals he set up. Looking to tap into this, Holloway used Clarke on Saturday in the hole behind the front three. It was noticeable that Clarke often picked up the ball from a rather deep-lying position, and with so much competition for the forward roles, Clarke’s best chance of any kind of regular action may be in this position. Matt Gilks won the man of the match award for most onlookers of a Blackpool persuasion, and quite rightly so, as the former Rochdale keeper put in another fine display. There is a case to be made that he is player of the season so far and more performances such as this will only strengthen that view. Once again ‘Pool had to rely on their stopper to bail them out of some worrying situations, Gilks making several excellent saves to keep Blackpool in the contest. One save in particular in the first half will be remembered fondly, as Gilks dived low to his right to deny McDonald – comparisons to Gordon Banks vs. Pele weren’t far off the mark at all. However, for all of the great work Gilks did, if we’re going to be picky then some of his distribution left a little to be desired. His desire to release the ball quickly is certainly to be commended, but sometimes a slight hesitation might be the best idea. Gilks’ quick throw-outs gifted possession to the opposition more than a couple of times, leading to some very dangerous moments indeed. However, that slight blemish aside Gilks is proving a steady foundation, and some minutes for Scotland are surely massively overdue. Matt Gilks was not the only Blackpool player to give up possession easily, and it was endemic amongst the men in tangerine throughout the match. Uncharacteristically for ‘Pool, the passing was not nearly as accurate as it could be and it led to some quick counter-attacks and end-to-end football, with Boro too guilty at times, although not nearly as often. The way Blackpool failed to hold onto the ball was down in part due to the strong pressing game employed by Tony Mowbray’s men. Middlesbrough sought to restrict the time ‘Pool had on the ball and did this well, particularly in the first half. Blackpool encountered this pressing tactic against Burnley a few weeks ago, but did cope slightly better this time around with a flatter midfield three. As already mentioned, Boro were the more dominant team over the course of the whole game, but it should not be underestimated what an achievement it was to come from behind twice. Doing so in any away game is an excellent feat, but at a team with such a handy home record the comebacks were even more impressive. In a pre-season contribution to The Seventy Two, I tipped Middlesbrough as a side who “could make a credible challenge for the play-offs”. It’s now clear Boro are genuine promotion candidates and so a point for ‘Pool should be regarded as a fantastic outcome. Blackpool’s inconsistent start to the season caused consternation and frustration amongst the Blackpool support and presumably staff and players too. However, two wins in their last two games have now left the team in fifth place and looking in better shape than they were two games ago. The majority of what you are about to read was written in the light of a 3-1 defeat to Burnley, however, the analysis here may well be useful when Blackpool hit another rocky patch later in the season as similar issues may be at the heart of any problems. First and foremost the most obvious thing missing from Blackpool this season is Charlie Adam. Added to that, both DJ Campbell and David Vaughan left the club in the summer to stay in the league where they rightly belong. What that means in measurable terms is pretty easy to define; however, it has also meant a great deal of upheaval on the pitch too with new players having to come in to replace them. Statistically Blackpool lost a significant chunk of their goal scoring output, both Adam and Campbell contributed 25 goals last season which equated to 45% of the total goals that Blackpool scored. 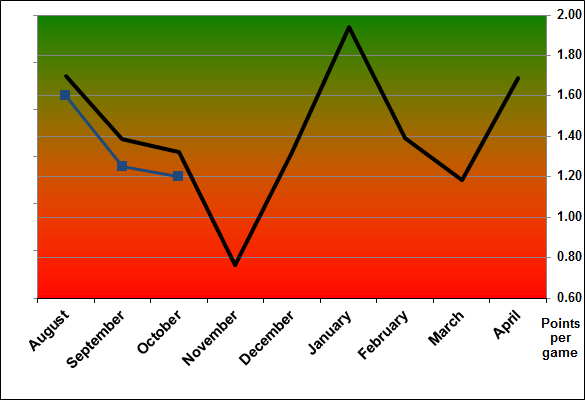 In the previous season they scored 27 goals which amounted to 36% of the total. In losing these players and those goals it has led to a selection dilemma for Ian Holloway and this is perfectly summed up when considering the fact that he has rarely stuck with the same first eleven. Barry Ferguson has come in and replaced David Vaughan, but perhaps doesn’t have the same energy as Vaughan. Whereas, Kevin Phillips has come in to replace Campbell but even though he has scored he may not link up play as well as his predecessor. However, more crucially Adam’s goals and goal creation are yet to be replaced. Losing players is a part of football and it’s how a manager copes with that which ultimately determines his success. Either you go like for like, recruit then fit or make concessions for replacements. A closer look will now be placed upon the way that Blackpool are setting up on the pitch. For a bit of background, Holloway has deployed a version of a 4-3-3 system for most of his time in charge. 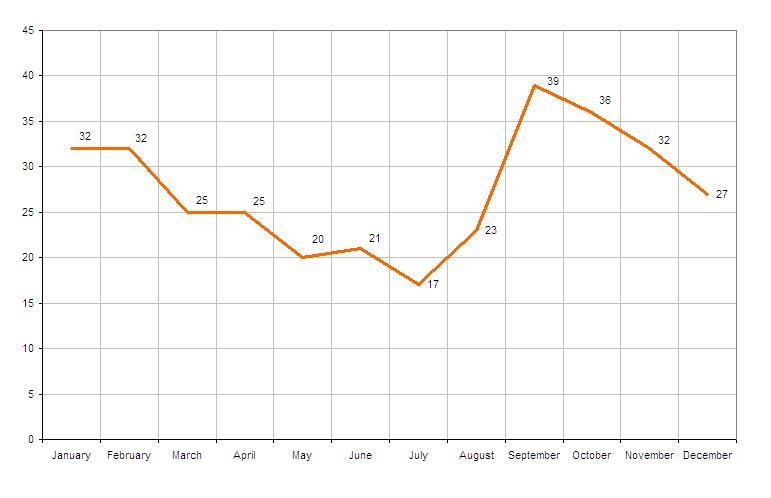 Last season the midfield shape varied mainly due to a pre-season injury to Keith Southern before reverting to a flatter midfield shape towards the end of the season. As stated earlier it appears that Charlie Adam hasn’t been replaced and arguably he cannot be replaced for the budget that Blackpool has available. He was the crucial link from deep midfield to attack and to understand why that is affecting Blackpool now, his role and position must be understood in more detail. The inter-relationship and roles of players on the pitch give formations their dynamic. For example, a 4-3-3 could be seen as a chain of relationships on the pitch that need players to combine. Not just from within one department i.e. the defence, but from more than one. The diagram below will hopefully give a visual representation of the point and to show how the side midfielders (Adam & Southern) relate to the defence and the attack. Last season, David Vaughan sat deeper in the midfield than Adam, who occupied the left hand side of the midfield three. His team within a team, aside from the midfield unit was the team of left full back and left forward too. Through this structure he excelled at bringing Stephen Crainey in to the play and building attacks with him and the left forward. This bridged the distance between midfield and attack and when it worked was when Blackpool were at their most devastating. The balance on the right of midfield was missing for two reasons. Either Elliot Grandin drifted centrally or Keith Southern tended to sit more instead of advancing with his unit. However, as Gary Taylor-Fletcher offered the team creativity from high up on the pitch on the right it helped to make up the balance. So how is this affecting Blackpool this season? Effectively that link no longer exists, the left footed midfielder has disappeared and with it, that link too. Stephen Crainey appears to get forward less often and Blackpool’s attack often appears slow and predictable. One key point of creation has been removed and a key point of team cohesion too. It will take time to eradicate and Ian Holloway has appeared to struggle to overcome this. The impact of losing Adam has caused a knock on effect for the midfield, which has been further hampered by the early season injury to Grandin. The opening game at Hull saw Grandin attack more aggressively than Adam would have and often he failed to track back. If you want an idea of the formation, it was very much a 4-2-1-3. In going for a 4-2-1-3 in the first match Holloway lost a little sight of the flatter midfield three and once Grandin was injured, Taylor-Fletcher was used in the role to varying degrees of success and arguably removed his forward from his most potent position as that of a forward, dropping deep to receive. This has led to Blackpool getting really out of shape and awkward at times and this has made Holloway twist and turn to get his new players in to something that is workable. Allied to Grandin’s forward positioning, Keith Southern has tended to stay deep and even drift centrally making Blackpool’s midfield shape very narrow. 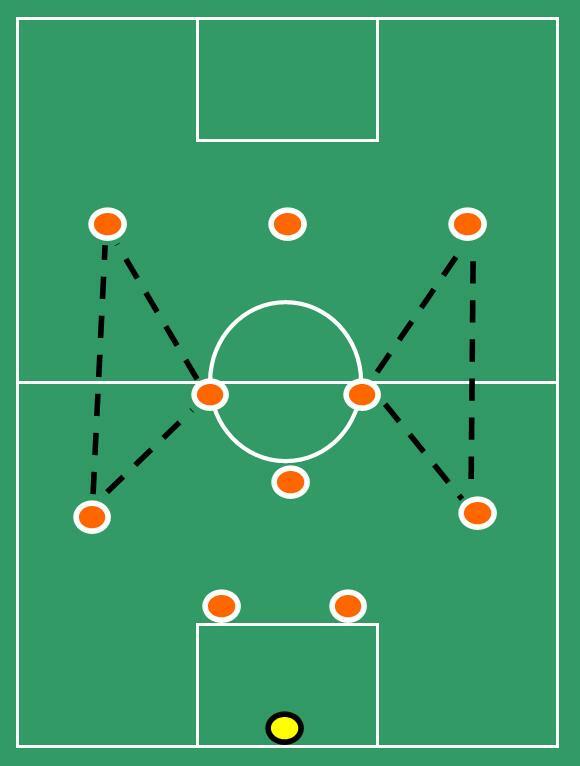 The diagram below shows how Blackpool’s links in the 4-3-3 have become stretched. Really stretching the midfields effectiveness, making them narrow and easy to play against. This loss of on-field shape has emanated itself in two ways, an unconscious way through players losing their way in a new system and more recently a conscious decision by Holloway to change the shape. What does this mean? Blackpool’s midfield shape had the midfield triangle of players pointing towards the opposition goal instead of the other way round in a conventional 4-3-3 shape. As both of the two players who have dominated in that role (Grandin and Taylor-Fletcher) are naturally attacking and have fewer defensive instincts that someone like Adam. This meant that at times this season they have been caught high up the pitch and any numerical advantage a three-man midfield might have given Blackpool has been lost. You can see this in the diagram below. When attacking, the formation has looked like an aggressive 4-2-4 and even at times a 4-4-2. This happened at times last season leaving Blackpool exposed in midfield and it has started again this season. When Grandin and Taylor-Fletcher are on their games such an application of their skills can be amazing to watch, however, lose the ball and all of a sudden Blackpool are open and ready to be attacked. It appears that Holloway acknowledged that the shape was too flimsy with the players he was using and consciously switched the team in to a 4-4-2 after a treble substitution against Doncaster which contributed to a comeback and a 2-1 win. He followed up against Nottingham Forest with a 4-4-2 but with less effect and switched mid game against Burnley to a 4-4-2. This was a sign that Holloway could see his team and how they were naturally forming on the pitch and for him to switch to 4-4-2 must have riled him as he doesn’t like the formation. However, you can see his logic for taking these steps and actively pushing his team towards a change of shape. It doesn’t appear to be a way forward and the recent 5-0 victory over Leeds saw him move back towards his more conventional 4-3-3. The question will be, will he switch back to the more attacking 4-2-1-3 once Grandin is fit again and if he does, will he remember to revert to a flatter midfield three when things are going against his side. Blackpool are at their best when they string together short passes and vary the tempo and point of attack. However, managers know this now and are actively trying to stop them and this has been key to Blackpool’s inconsistent start. Last season few managers tried to alter their style to combat Blackpool and paid the price with a defeat. This season Blackpool are there to be shot at. Hull did what they could to stop Blackpool in the first game, but Derby were the first team to really jam up the midfield and stop Blackpool playing. It is here that Holloway and his players have been slow to find ‘in game’ solutions to tactical problems being posed. Partly because of the players at his disposal, but partly because this is a new experience for them. They’ve been used to having space to play their game and express themselves, but now they are back in the Championship teams want to throw them off their stride and deny them all the space they can. The midfield approach of some teams this season has exploited the previously mentioned issue of an aggressively placed midfielder and accentuated the distance between Blackpool’s midfield and attack and contributed to the cutting off of the supply to the forwards. 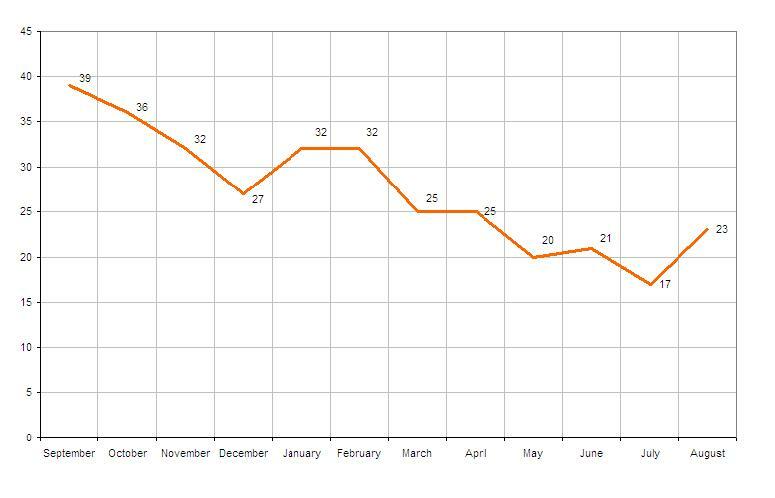 The diagram above highlights how a well-drilled midfield has overcome Blackpool and effectively divided their team. Added to this Blackpool have been slow to react in the game. Both Charlie Adam and David Vaughan have excellent appreciation of tempo and when to start picking up the pace of pace to circulate the ball faster. Blackpool have few midfielders to do this now and any numerical disadvantage they’ve suffered could have been overcome with quicker movement of the ball. It was noticeable in the game against Burnley that in the second half Barry Ferguson pushed harder when in possession to drive the team on and for the first time this season it appears like Blackpool’s midfield had gained a new dynamic. Add in the better ball skills of Ludovic Sylvestre in the game against Leeds and all over a sudden the solutions appear to be more forthcoming. In fact, the reintroduction of Sylvestre may well have done more to reinvigorate Blackpool than the emphatic nature of the recent back to back victories. He offers the more natural midfield option, less likely to get caught high up the pitch, comfortable in the deep, he also appreciates game tempo and understand where passes should be directed in the final third. What this has highlighted is that the solutions Blackpool have been looking for aren’t that hard to find and hopefully Holloway will veer away from changes in shape to remembering what has worked well in the past and who he still has at his disposal. So what have we learned in this rather long-winded ramble? That Blackpool have struggled for consistency this season due to losing key players and not knowing how best to replace them. By losing sight of what they do well. By losing their shape that brought them so much success. And finally by not adjusting to sides who are happy to shut them out and take a point. As highlighted in part one, this is a long season and no doubt Blackpool will go through similar cycles of poor and good form. However, the signs are forming that Holloway is learning that his new team may not be far away from showing their real potential.